Replacement key fob for less. Finding a replacement key fob will be less expensive if you are educated and prepared with the proper information. Key fob remotes are sold separately from the key and will cost extra. 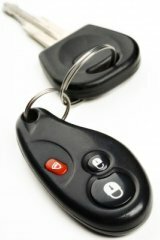 Keyless remote entry key fobs -- these remotes fit cars with the factory remote keyless entry system. If you lose your key fob or need a replacement battery, you'll want to find the least expensive way to get it. We stock remotes for most vehicles on the road today. And the ones we don't have in stock can be ordered and shipped in to us in a day or two. A1 Locksmith has car keys and programs remotes! Most cars have keys with transponders hidden inside the plastic head of the key. When a key is inserted into the ignition lock cylinder and turned, the car's computer sends a radio signal to the transponder. Unless the transponder replies with a valid code, the computer will not allow the engine to be started. These are called "Transponder Keys". They have no battery and are are energized by the radio signal itself. If you are not careful this can be a very expensive process, especially if you have a lost car key.